All in all, it was something of a dream week for the airline. 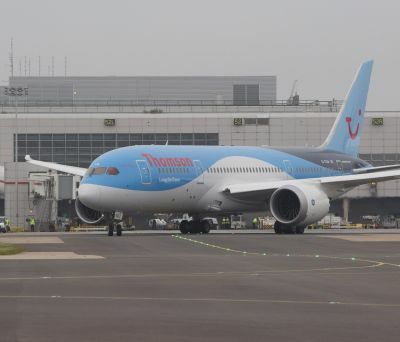 Just days before the 787 inaugural on 21 June, Thomson had been voted ‘World’s Best Leisure Airline’ in the World Airline Awards announced at the Paris Air Show. Clearly, spirits might well be high aboard that early morning Thomson 787 flight between Gatwick and Mahon. So there we were – senior figures from Thomson and parent company TUI Travel, media guests and unsuspecting holidaymakers – cocooned and well away from stresses of life on the ground, on course to live a bit of the dream. The 787 lives up to its hype. The high-ceilinged, wide-body cabin with large windows (30 % bigger than average) is agreeably spacious. 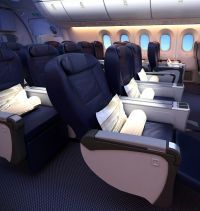 Pressurised to just 6,000 feet, with advanced air filtration systems, the cabin environment is noticeably comfortable. The new high-tech engines are less noisy, both in the air and on the ground. The 787’s gull wings handle turbulence with ease. There are the novel dimmable windows; the lighting system which adapts to time zones; larger toilets, wider aisles and bigger overhead bins. You could go on endlessly about the aircraft’s many other tangible passenger innovations but equally important is the subliminal feel-good factor of knowing that a 787 flight burns 20% less fuel than other aircraft of equivalent size. Environmental care sells, if enthusiastic passenger comment was anything to go by. Of course, this flight was the first of a series of short haul ‘run in’ trips. Thomson’s ultra-long range 787 will really show its paces and come into its own on intercontinental service which starts on 8 July. 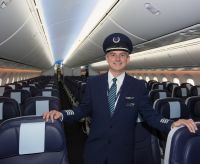 Nevertheless, having won the lucky dip to become first choice destination for the inaugural UK 787 passenger flight, Menorca literally rolled out the red carpet, struck up the band, lined up cheering children, paraded the island’s famous dancing horses and handed out the local gin sling (‘pomada’) at Mahon Airport. Dreamliner-fest it certainly was. Time then, for a leisurely harbour-side lunch in Mahon followed by a gentle stroll around the historic old town. Two things you need to know about the place: Mahon has one of the world’s two deepest harbours (the other is Pearl Harbour); and never in a restaurant say ‘hold the mayo,’ because this is where the dressing originated (Mahon-aisse) and Menorcans are very proud of it. High on cliff tops overlooking that deep, deep harbour Mahon’s old town is an elegant, rambling neighbourhood of cobbled streets, plazas, historic churches, museums and shady, sub-tropical gardens. The remnants of ancient mediaeval walls rub shoulders with smart, high-end shops. Not to be missed is the imposing neo-classical Town Hall, nor the Santa Maria and Carmen churches. One significant impression left on this visitor was Mahon’s cleanliness. For a busy tourism, entertainment and shopping centre, the place is remarkably tidy and well-kept, so full marks to Mahon for that. In fact, environmental care seems to be evident right across Menorca – it’s a gentle, civilised, house-proud sort of island. But then, so many UK holiday visitors and expatriate residents know this already – that’s why they come in their droves. Various periods of British occupation have left their marks and still do. Back in the 18th century, Brits taught Menorcans to make that gin for which they are famed. More recently, they established a cricket club on the island and play twice weekly. For a more Mediterranean-style afternoon, a call at Bodegas Binifadet, not far from Mahon, is recommended. There, visitors are welcome to sit back on a shady vineyard terrace and taste the range of six or seven very decent wines made traditionally on the premises.